Mobile Phone Repairing Tools – Learn about all tools and equipment for mobile phone repairing. 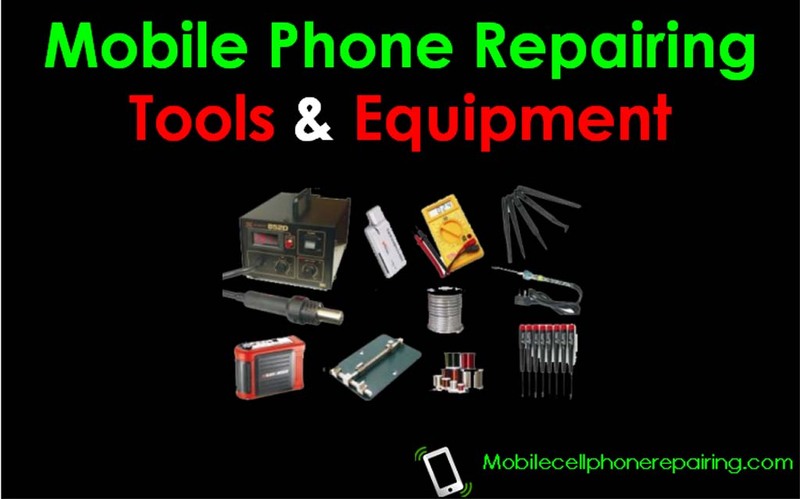 These tools and equipment are good to repair any mobile Phone. Mobile phone repairing tools are simple and easy to use. The same tools are used for repairing and brand of mobile phone including – Samsung, China Mobile Phones, Motorola, HTC, Sony, Alcatel, LG, Panasonic, Huawei, ZTE, Spice, Lava, Sony Ericsson, Micromax etc. Mobile cell phone repairing tools are not very expensive. Beginners must start with cheap and economical tools and gradually when they gain knowledge and experience, they can buy more professional and branded tools. Soldering Iron: This is a simple plug and use tool used to solder. Soldering Station: This is a soldering tool used by most mobile phone repairing professionals. It consists of a station to control temperature and a soldering iron plugged into the station. SMD Rework Station or Hot Air Blower: Used to Desolder and remove SMD Electronic components and again solder them back to the PCB. PCB Holder: This tool is used to hold the mobile phone PCB while repairing. Solder Wire: This is used for soldering. It is better to use flux-cored solder wire for better soldering. Thinner or PCB Cleaner: This chemical is used to clean the PCB. Jumper wire: This is a thin insulated copper wire used to jumper where tracks are broken or when any electronic components if faulty. Precision Screwdriver: This simple tool is used to open and tighten tiny screws of mobile phones. Tweezers: This simple tool is used to hold electronic components while soldering or repairing. ESD-Safe Cleaning Brush: This is a simple brush used to clean the PCB and other parts of a mobile phone while soldering. Multimeter: Used to test and check tracks and components. Battery Booster or Battery Eliminator: Used to boost uncharged battery or a mobile phone. Ultrasonic Cleaner: Used to clean PCB and electronic components. BGA Kit: Used to repair BGA Electronic Components. Magnifying Lamp: Used to see a magnified view of tiny components and parts that cannot be seen properly with natural eyes. This tool is useful to see fine-pitch SMD components. Mobile Opener: Used to open the housing or case of the mobile phone. Many professionals do the same job with their nails. DC Power Supply: Used to start a mobile phone without battery. It can also be used as a Multimeter. Liquid flux: Used for soldering. Solder Paste: Similar to solder wire but in the form of paste. It is used to solder SMD components. Cleaning Sponge: Used to clean soldering tips. Desoldering Wire: Used to remove excess solder from the PCB. LCD Tester: Used to test the LCD of a mobile phone. Wrist Strap: Used to ground Static Charge of the Human Body. pliz thanks for this educative site. Sir, i want direct cource trainning from you. Any recommendation on the iron tip e.g. what’s commonly used size/shape? Generally conical pointed soldering tips is used in mobile phone repairing. Hakko is the manufacturer of soldering station, iron and tips. could you please give me the exact model of soldering station and how can i buy it?? You can buy Hakko FX-888D from my Company PCBA Tools: http://www.pcbatools.com . Just send me an enquiry from the website.